Before I share my loot, I would like to apologise to my fellow Loot participants. I generally try to get around to each person's blog to comment on their loot posts, but it just hasn't happened for the last few weeks. I promise to try and do better! Now that is out of the way, here is the loot that I got from my library this week. The Sweetness at the Bottom of the Pie by Alan Bradley - I am a sucker for this kind of title on a book! I have seen it mentioned a few times on the blogs so finally picked it up this week. Seducing an Angel by Mary Balogh - The next book in the Huxtable quintet. I am partial to purple! Ellie by Lesley Pearse - I was actually looking at a different book that I really wanted to read but put it back on the shelf when I realised that it was 750 pages long. The irony this book is 730 pages. Those 20 pages make ALL the difference! When I picked this one up off the shelf I thought it must be a new release, but I think it is more likely that it is a new copy of the book at the library given that it actually came out more than 10 years ago. I have never read this author, but I have heard good things about her. The following books are all reloot. Maybe this will be the time I actually get to read them? 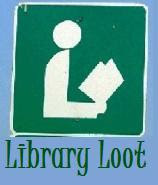 What did you get out from the library this week? Add your link to Mr Linky so that we can all come and be a bit nosy and see what you borrowed! I look forward to your thoughts on the Bradley book, I seem to see it mentioned everywhere. If it's good, I might read it for the Canadian Books Challenge 4. I love that expression "partial to purple". You really have to like romance novels to read one as long as Ellie, hope it's a good one for you. My LL link is up. Having a miserable time healthwise-somewhat like poor Eva but all my recent reads have been so good. Enjoy your loot. 1. Sabriel is awesome, I hope you enjoy it. 2. I look forward to hearing about The Sweetness at the Bottom of the Pie as it keeps showing up everywhere in my life - practically begging me to read it - and I am still on the fence for some reason. I hope that you enjoy The Sweetness at the Bottom of the Pie, as I have heard such great things about it all over the place. I am also interested in Sabriel. My son has that whole series on his shelf, and your review will probably tell me if I should ask to borrow it from him! Enjoy your new books! How exciting to join in on this! I just got a copy of The Sweetness at the Bottom of the Pie, too! I've heard such great things about this book and am really looking forward to reading it. I loved Sweetness at the Bottom of the Pie - prepare to love Flavia (hopefully). I'm also a big fan of Sabriel - it's my favorite of the series. I've heard a lot about Sweetness, too. I've enjoyed all of Balogh's books in the Huxtable series. Constantine's story is out now, but I'll wait for the paperback version! Happy reading! I hope you'll love Alan Bradley's Flavia, too - I did. Very entertaining reading. I love the J.D. Robb series and thought Divided In Death was really good so you definitely need to pick that one up asap! Enjoy all of these! Joining in on Library Loot. =] My blog is new, and I'm excited to get to know the Book Blogging community. Jezrul and Milly, welcome to Library Loot. Samantha, I always enjoy them, so I really should just set aside a few hours and read it! First step, moving away from the computer! Cat and Michele, the Bradley seems like a popular choice! Lady Q, I have liked the Huxtable's but not loved them. I am not quite sure what it is that they are lacking but there is something. Not enough to stop me from reading them though. Melissa, I liked the Keys to the Kingdom series from Nix, so I do think I will like Sabriel. Just need to find time to read it. Zibilee, I have heard good things about both series too. It;s funny when books haunt you isn't it, even pretty girls need to read. Sandra, I didn't realise that Ellie was a romance. I love Sabriel! I actually did a Teaser Tuesday about it not so long ago. Nice loot! I just left a link to my loot to Mr. Linky. I checked out Sweetness at the Bottom of the Pie a while ago but had to return it before I read it. I'll have to try again! Alisonwonderland, I do that all the time! Irishrosedkm, I am pretty sure I will like Sabriel when I do start to read it. I thought The Sweetness at the Bottom of the Pie was so much fun, so I hope you enjoy it. Flavia is something else. And though I am not a namer of inanimate objects, she kind of made me want to name my bicycle, or at least give it more respect.